Gatherings and events outside are commonplace in New York City throughout the summer. It may seem as simple as discussing the event with the community board to get approval, but that’s not always the case. Street closings and street fairs require Temporary Public Assembly Permits (TPA). What is a Temporary Public Assembly? Temporary Public Assembly (TPA) permits are used for temporary events. Typically a TPA is required for most indoor or outdoor events, where PAs are not filed. This could be an event in the park, a street, or a warehouse. These places have large enough spaces for large amounts of people to meet in, but are typically not used for this purpose. Permanent Public Assembly permits are required for bars, ballrooms, etc of a particular size. The calculations for amount of people vary depending on the use of the space. When are Temporary Public Assembly Permits Needed? 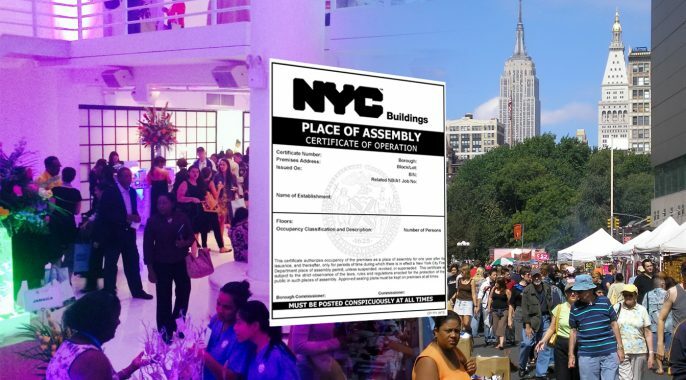 TPAs are generally required by the New York Department of Buildings (DOB) in conjunction with the Fire Department of New York (FDNY) when more than 75 persons are gathering indoors, or more than 200 persons for outdoor events. TPA permits are issued for events lasting up to 30 days. People looking to have TPAs for more than 30 days must be reviewed through the Borough Commissioner’s Office. What does a TPA allow? Cooking is not allowed under most TPA permits. The applicant (engineer or architect) specifically request cooking to obtain must approval by the DOB and FDNY. If not specifically requested at issuance of the TPA, then additional permits must be required. Separate Open Flame Permits are required to be issued by the FDNY for sternos, grills, ovens, etc. and are issued upon payment at their TPA inspection. Equipment must be inspected prior to the event. TPA permits may be requested at least 10 days prior to an event. Additional fees of $100 for each day past the due date will be applied to processing fees if not filed 10 days prior to event. TPA permits are time-critical, so it is of the utmost importance to plan the event and aim to acquire permits as far in advance as possible. TPA may not be the only permit required for each event! TPA permits allow the gathering of people in indoor or outdoor spaces. This may be all some events require, but events on public streets or parks may additionally require Special Events permits from the DOT. Events requiring cooking require more documentation from the FDNY, too. Direct Access consults on events and expedites TPA permits. We have architects and engineers on staff to produce the documentation required. Our expediting staff will work hard to obtain the approvals and permits to enable your event to get underway. Please contact us today for a consultation on what permits are needed for your event. Including TPA permits, if required. Posted in DOB, DOT, FDNY and tagged DOB, DOT, FDNY, fire protection, Fire safety, Open Flame Permits, PA, Public Assembly, special events, Temporary Public Assembly, TPA.